(CNN) -- Somalis forced to flee war and drought are living in overcrowded and unsanitary conditions at home and in neighboring countries, including in Kenya and Ethiopia, an aid agency said Thursday. 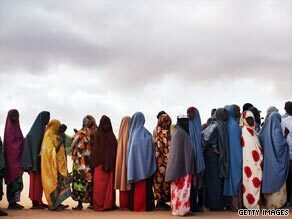 Somali refugees in Kenya queue to find out about a move to a displacement camp. Somalia has seen a rise in fighting between government forces and the Islamic militant group Al-Shabab, which wants to implement a stricter form of Sharia law or Islamic religious law. The clashes have left scores dead in recent months. The country in the Horn of Africa is also going through the worst drought in 10 years, international agency Oxfam said. "Hundreds of thousands of children are affected, and the world is abandoning the next generation of Somalis when they most need our help. Why does it seem like you matter less in this world if you are from Somalia?" The international community has failed the refugees, who have little access to basic services such as water and medicine, Oxfam said. About 8,000 Somali refugees flock into the Dadaab camp in northern Kenya every month, the aid agency said. The camp, which has facilities for about 90,000, has 280,000 refugees who have no access to basic necessities, including clean water, Oxfam said. "The Kenyan government has repeatedly promised to provide more land to ease the overcrowding, but has so far failed to do so," Van den Berg said. "More pressure from the international community is needed to make it happen." Kenyan officials decried the criticism. "It is wrong to say we are not doing anything," said Francis Mwaka, a federal communications official. "The Kenya government is aware of the problem and is working on a solution." Several government departments that deal with refugee issues are planning to meet next week, Mwaka said. "During this meeting, they will discuss the possibility of having another camp for refugees in the country or relocating some of the ones in Dadaab to another camp," he said. Mwaka confirmed Oxfam's report that the Dadaab camp was built to host 90,000 refugees. In Ethiopia, the Bokolmayo camp has about 10,000 people. At least 1,000 people arrive there every month, but the facilities are not adequate enough to handle the influx, Oxfam said. Meanwhile, in Somalia, insecurity has hindered international aid agencies from reaching the 485,000 people who have fled the capital, Mogadishu, to nearby Afgooye, Oxfam said. The displaced are getting help from Somalis, who do not have enough resources, it added. "In all three locations -- Afgooye, Dadaab and Bokolmayo -- the services being provided to vulnerable and desperate people are far below international standards," Van den Berg said. About 1.4 million people have been displaced in Somalia and 500,000 more have fled to countries in the region, according to Oxfam. The transitional government has been mired in chaos since 1991 when warlords overthrew dictator Mohamed Siad Barre and sparked brutal clan infighting. Government officials have struggled to establish authority amid challenges by Islamist groups that have seized control of some cities.